Coffee Etc, located in the main lobby of the Bill Gray’s Regional Iceplex is not you average snack bar. We feature fresh ground local roasted coffee and a full espresso bar. 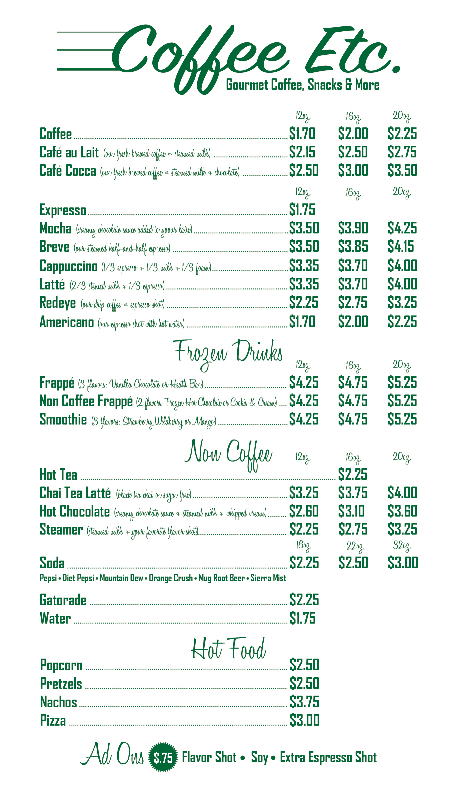 We feature drinks such as Mocha’s, Latte’s, Cappuccino’s and the best hot chocolate around! Coffee Etc, also serves pizza, popcorn, pretzels, nachos along with many other grab and go goodies. On weekend mornings there are also fresh pastries brought in from a local bakery.